ENGEO Incorporated has been recognized as one of the top 25 best small companies to work for in America by the Society for Human Resource Management (SHRM) and the Great Place to Work Institute, Inc. (GPTW). Placing thirteenth, ENGEO is the only small business from California to earn the distinction. Winners were announced this morning at SHRM’s 61st Annual Conference in New Orleans, the largest gathering of HR professionals in the world. 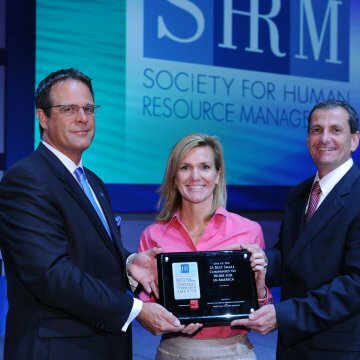 SHRM and GPTW have revealed the nation’s top 25 small and top 25 medium-sized employers for the last six years. Hundreds of companies across the United States submitted entries in the very detailed and competitive analysis conducted by GPTW. The rankings are primarily determined from employee opinion surveys that analyze an organization’s workplace culture. Employee-survey responses count for two-thirds of an organization’s score. The evaluation process also includes the assessment of organization practices and perspectives from the leadership team, which accounted for one-third of the group’s score.